This category leaves the most room for discussion about what you really need versus what is just for show. Remember, you will most likely go through various stages of equipment as you continue to develop your abilities as a triathlete. The truth is that you should not necessarily start with top shelf gear. If you have been exclusively training and racing on a road bike, it may be time to invest in a triathlon bike. Your speed will increase with the more aerodynamic build and fit, your legs become better conditioned for the transition from bike to run as the aero position puts less emphasis on your quadricep muscles, and you will become more efficient overall with a bike designed specifically for triathlon racing. If you’re going to invest in a triathlon bike or, even if you have a road bike but have never been properly fitted, now is the time. While there are plenty of aero components on the market, the most important component of aerodynamics on the bike is you. 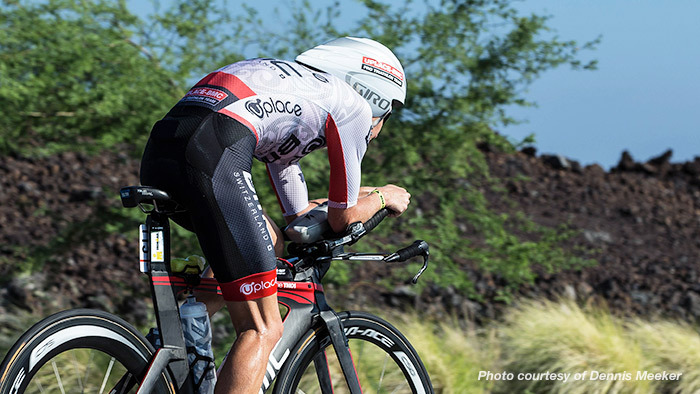 There is no sense having a tricked out, aerodynamic triathlon bike if your body is not in the best possible position to cut through the wind. Relatively inexpensive, especially when compared to aero wheels, aero helmets offer the biggest bang for your buck. The benefits of an aero helmet have long been known, and there is now a wide variety of helmets on the market you can choose from. You know what your weakness is and the only way you will improve is with practice. For me, the swim remains my biggest challenge so I started getting in the water five days a week and have slowly been cutting my swim times. If you have a coach, consult them on what the best approach is to strengthen your weakest link. If not, take a good look at your training history and see where you should be spending the most time in your training going forward. Remember that the bike portion is where you can make the most significant impact since it’s the longest distance. Also, consider any weakness you have that is not sport specific. For instance, you may feel that a lack of strength causes you to break down, that you frequently get injured, or that your nutrition just isn’t dialed in. These issues are more general and affect your overall ability to train and race well. Attacking a weakness means finding out exactly what is causing the issue. It is not enough to say that you are weak on the run. You must ask why that is the case. Do you not pace the bike correctly? Is your training not sufficient? Have you spent too much time running long and not enough time at higher intensities? You must identify the cause of your weakness and then you can train to strengthen those areas. The planning and intensity needed for an actual race can only improve your overall confidence. Plus, smaller or shorter races are a great time to test out nutrition and gear before your A race. If racing often is not possible, try simulating race paces in your training. The more you pay attention to how you’re feeling, what you’re eating, and how you pace your training and racing, the more likely you are to improve. Consider keeping a simple journal, or use the Post-activity comments in TrainingPeaks to remind you of what felt particularly good or bad during a swim, bike, run or race. Also pay close attention to what can be mitigated or cut entirely from your training, racing, gear and nutrition. We all have bad races, it’s what you learn from them that will make you a better triathlete. A major component in taking your triathlon to the next level depends on how you are fueling your body, before, during and after training and racing. Think about the duration and intensity of your focus event and mimic your hydration and nutrition needs in your training. Fueling is something that should be studied and practiced many times before race day. These five steps can help you gain fitness, speed, and knowledge to have a better, more positive experience in the sport of triathlon. As you progress in the sport, don’t forget that these steps still apply. Continuing to refine your training, race strategy, equipment, nutrition and other factors is an ongoing process and part of the journey. Allie is a freelance writer, competitor and twin mom. Her work has appeared in Runner’s World, Women’s Running and ESPNW. On her blog – href="http://vitatrain4life.com/">VitaTrain4Life.com. she chronicles her life as a triathlete and hopes her successes and failures help to motivate and inspire others, even the over 40 crowd she somehow found herself in!